In the years that the Liberals have been in government in Ontario, the spending power of Ontario Works (OW) and the Ontario Disability Support Program (ODSP) has been allowed to fall. While the Tories cut social assistance rates, the Liberals have provided increases below the rate of inflation, driving people deeper in poverty. Today, it is becoming clear that the effect of declining income for people on social assistance is not just producing a gradual increase in poverty related issues, like homelessness and hunger, but is leading to a sudden growth in these social problems that is rapidly assuming the proportions of an enormously serious crisis. Combined with other measures of austerity and a housing crisis that is driving up rents, inadequate income is taking a terrible toll. The Ontario Association of Food Banks (OAFB) says that 500,000 people turned to food banks in 2016 and that it is normal for 70% of income to be spent on rent. Across Ontario, homelessness is out of control, even in smaller centres. In Toronto, the City authorities are reluctantly scrambling to provide shelter space for the rapidly expanding homeless population. Those who are on the front lines of the crisis agree that the scale of it is unprecedented. The City of Toronto’s own official figures give some sense of the situation. The Daily Shelter Census shows 5,791 people crowded into the shelters on February 8, with another 777 in the sub standard ‘winter respite’ back up facilities. In January of 2017, an average of 4,366 people stayed each night in a Toronto shelter. During the same month of this year, it had risen to 5,663. The crisis has worsened horribly and shows every sign of becoming even more severe. For someone forced to live on social assistance income, with a single person on OW receiving little more than $700 a month, the ability to eat adequately and remain housed is severely compromised. There is every indication that the crisis this is creating is already spinning out of control and can only get worse. Remove the cap on the Community Homelessness Prevention Initiative (CHPI) to ensure municipalities can meet shelter and housing support needs. Raise social assistance rates to the modest levels being provided on the present basic income pilot project, which is providing income at about 75% of the Low Income Measure, up to $16,989 for a single person with an additional $6,000 for disabled people. After more than two decades of austerity based attack on the incomes of poor people on social assistance, it is time Raise the Rates. 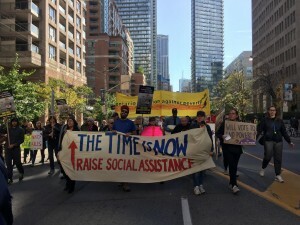 Raise Social Assistance Rates Now to at least the Basic Income pilot rates indexed to the real cost of living experienced by poor people with existing supports intact. Stop Cuts to Benefits and Supports and reinstate the Community Start Up and Maintenance Beneft. Provide Accessible Supports with Dignity. Eliminate the punitive surveillance from the administration of social assistance so that workers can better provide necessary and comprehensive services. Ensure Access to All Immigrants. Everyone in Ontario who needs social assistance should get it, regardless of immigration status. Amend the Employment Standards Act to ensure the minimum wage in Ontario is raised to $15 an hour by January 1, 2019 to include students and liquor servers. This entry was posted in Toronto and tagged Homelessness, Ontario Liberals, Poverty, Raise the Rates, Social Assistance on March 6, 2018 by admin.